As far as superpowers go, super speed really isn’t all that bad. The Flash is so fast that he can vibrate his molecules fast enough that they can pass through WALLS. Plus, with all of his lightning reflexes, I bet he’d be an awesome samurai. This entry was posted on Friday, June 11th, 2010 at 12:00 am and is filed under Comics. You can follow any responses to this entry through the RSS 2.0 feed. Both comments and pings are currently closed. I like the Batman facepalm. 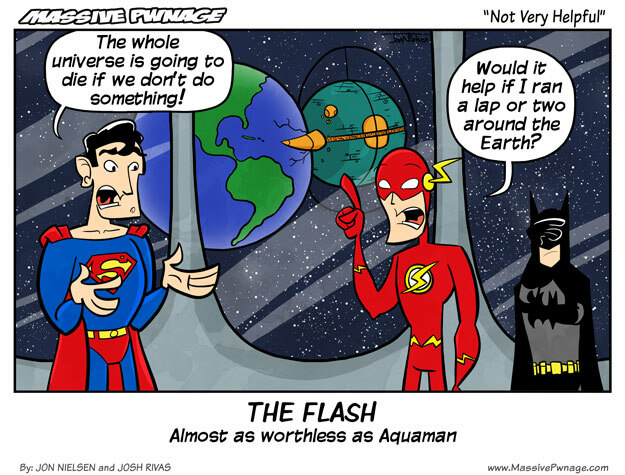 And Aquaman is useful, if you are at the olympics for swimming. The rest is inspired, but Unicron *really* makes this for me. And is Batman more useful? when did the transformers decide to destroys the earth??? What’re most superheroes gonna do in this situation? Besides, the Flash could round up the speedsters and go about whipping up a network of powerful cyclones to try and buy the big guns and brains some time. Is that more useless than someone like Spiderman? What’s he gonna do – fire some pissy web at it? James, I agree, lol, but in comparison, the Flash is a superhero limited in what he can do, Aquaman is just plain handicapped. Flash can vibrate the molecules in your head and turn your brain to mush. He doesn’t do that, cause he’s a good guy, but if he was evil, he’d be deadly. I remember watching the Justice League when I was a kid, then realizing that if the Flash was willing to risk killing himself or his enemy, then there’s no way he could lose.